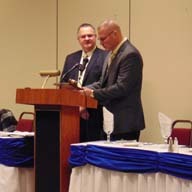 January 9, 2015, Canton, MI – Canton Public Safety Director Todd L. Mutchler has been sworn-in as President of the Southeastern Michigan Association of Chiefs of Police. The new board pledged their Oaths of Office yesterday, administered by 35th District Court’s Honorable Chief Judge James A. Plakas. Southeastern Michigan Association of Chiefs of Police is a non-profit organization made-up of law enforcement administrators with the common goal of improving the delivery of law enforcement services in the communities in which they serve. The organization engages in educating its members, empowering them to address local and regional issues including trending community concerns, laws, and legislation.